I finished knitting up my sweater at knit night last week. Of course the last tidbit to do was block and seam. If you were to guess that I thought about doing it all weekend and went on my merry way completing other tasks you would be absolutely correct. Today as I was talking to my mom we realized that Park City, Utah is going to be cold next week. 50F may not seem cold unless you are coming from somewhere where it has been 80 to 90F for a couple of weeks. This was all the push I needed to finally block the sweater. 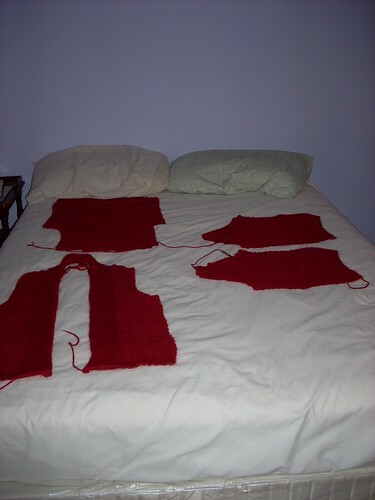 I will seam it up along with my other project that I finished over the weekend, tomorrow at knit night. Then I will be able to wear my own very warm (suri merino!) handknit sweater to ward off the chill in Utah. Huzzah! 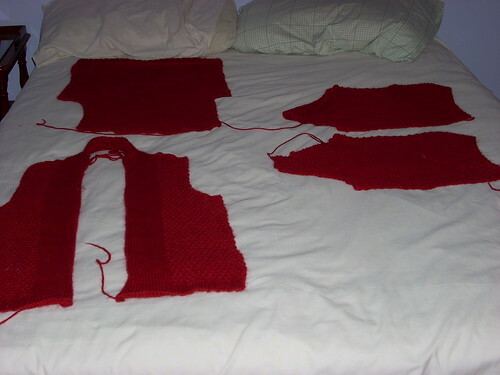 The sweater drying after being blocked. On another note, I *love* this Suri Merino. It is a gorgeous color and stays equally beautiful when wet. So even if I get caught in a torrential downpour my sweater will still look good. 🙂 (Priorities!) I am not sure if it was the Suri Merino or the terry cloth towel but after I patted these dry (rolled up in towel and stepped on towel to squeeze out water) the pieces were almost completely dry and the towel was soaked. 🙂 But that means I won’t have to worry about them taking forever to dry even with the 80% humidity we have here in Ohio. Nice work! Can’t wait to see it pieced together. Maybe even a shot with you modeling it! Yay! I can’t wait to see it seamed and on you!